This was actually a pretty great week until yesterday, when I had to spend half the afternoon dealing with Spectrum, as I finally decided to switch my grandfathered-in Time Warner internet plan to one of the newer ones, which meant new hardware that had to be hooked up and activated. It’s all supposed to be automated and as simple as calling a number and saying “activate,” but that turned out not to be the case. The tech support guy I dealt with was very nice and did finally get things sorted, but over an hour on the phone with anyone is usually enough to fry my nerves for the rest of the day. An hour on the phone with a tech support guy stumbling through settings to find out why things aren’t working the way they’re supposed to is basically torture. Honestly, I’m still feeling frazzled and resentful about the whole experience a day later. Halloween was on Tuesday, and we kept it low key here. It was the first Halloween my daughter chose not to go trick-or-treating, which was kind of sad. She went to her grandparents’ house to help hand out candy instead, so we were left to our own devices. We don’t get trick-or-treaters at the apartment, so I ended up just staying up far past my normal bedtime to finish a post about Star Trek: Discovery. Let’s just say there was a lot to unpack in the most recent episode. Wednesday marked the start of NaNoWriMo, which I’m kinda doing this year. I’m not writing a novel, but I am treating the whole month as a sort of productivity exercise in the hopes that it will help me get back on track to where I’d like to be in terms of writing content for the blog, which will in turn (ideally, anyway) put me in a better position, come the first of the year, to work on a couple of ambitious project ideas I’ve been sitting on for a while. Right now, I’m all about instituting more structure in my day-to-day life and building a routine that will allow me to accomplish big goals in the future. So far, it’s gone okay, even if yesterday turned out to be a total loss, what with dealing with the cable company and all. This coming week should be even better. Every year for Halloween, the Book Smugglers publish a short horror story. This year’s is “Nini” by Yukimi Ogawa. The cover and table of contents for Issue 19 of Uncanny has been revealed, and it looks fabulous. The new issue of Strange Horizons celebrates SFF from the Arab League community. Congrats to the winners of this year’s World Fantasy Awards! If you, too, are participating in NaNoWriMo, Tor.com has a nice collection of advice and pep talks from popular SFF writers. It looks like there might be a new Red Sonja movie, and I am here for it. The AV Club covered Victor Lavalle’s Destroyer in Friday’s Big Issues column. Charles Payseur is still mapping short SFF at Nerds of a Feather. This week: Fun Short SFF. At Queership, Elizabeth Bear (The Stone in the Skull) wrote about identifying with the monsters in stories. Benjanun Sriduangkaew, whose novella Winterglass is out in December from Apex Publishing, wrote about writing queer stories without queer tragedy. R.E. Stearns shared her Favorite Bit of her debut novel, Barbary Station. Singapore’s The Straits Times profiled Ken Liu, JY Yang, Aliette de Bodard, and Marjorie Liu. At the Powell’s Book Blog, editors Dominik Parisien and Navah Wolfe asked several of the contributors to their fantastic anthology, The Starlit Wood, to share their thoughts and perspective on retelling fairy tales. 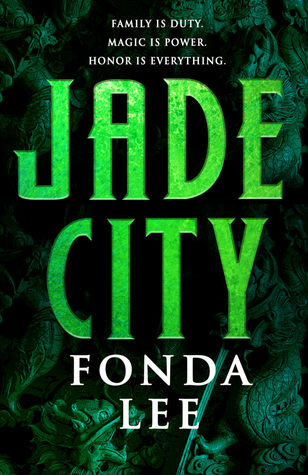 At Terrible Minds, author Fonda Lee offers her new novel, Jade City (out November 7), as an anti-NaNoWriMo case study. Lee was also interviewed about Jade City over at The Illustrated Page. Also, I was lucky enough to get an advance copy of Jade City and just finished it last night. I’ll be writing a longer review, but it’s incredible and you should order it right now. It’s been a week full of people having all kinds of terrible, poorly informed opinions about the Civil War. If you are one of the people who has those opinions, or if you aren’t sure you’re not, Ta-Nehisi Coates has a handy list of 5 Books to Make You Less Stupid About the Civil War over at The Atlantic. The Oral History of 1997’s Cinderella is one of the best things you could read this week. You also owe it to yourself to read the NYT profile of classicist Emily Wilson, the first woman to translate The Odyssey into English.